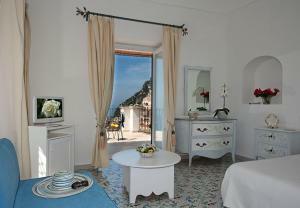 High season in Positano lasts at least June to September, plus Easter (and, if they're open, Dec 24–Jan 6). Some hotels even extend high season prices into April and October. In the winter off-season (late October or November through March or Easter) few hotels are open. However, prices are pretty good in the off-season—though Positano is never the sort of place you could consider "cheap." This discreetly elegant hotel has long been favored by the likes of George Clooney and Julia Roberts for its location just beyond the village (and the crowds) and its elegant 18th-century-meets-1970s fab rooms spilling down the cliffside in a profusion of terraced gardens. The Hotel California's proprietor, Mary, is a larger-than-life Italian auntie who welcomes guests like family in her 1677 palazzo just five minutes from the beach. 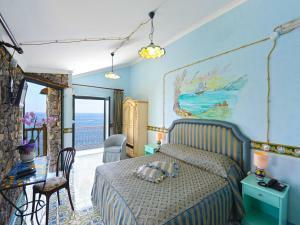 A dozen rooms have sea-view balconies and four sport ceiling frescoes. There's also a lovely vine-shaded common terrace for sunset cocktails. Bonus: Free parking. A modestly classy hotel with a dash of private home feel, tucked amid the stair-stepped alleys with thrilling views over the beach, Positano's tumble of pastel houses, and the lush coast. Best rooms: Nos. 22–24 with the big terraces (though No. 31 has a hot tub for two in a bath-with-a-view). Avoid rooms Nos. 25–27 with truncated vistas. The Sersale family's 18th-century villa with Pompeii-red walls is the top place to stay in the heart of Positano (though Il San Pietro, outside town and described below, is the chicest spot of the moment). Former guest John Steinbeck summed it up best: "an old family house converted into a first class hotel." Right across the street from swanky Le Sirenuse (below) with twice the view at 1/4 the price. Quiet and basic (with a bit of noise from the road below, rarely a problem at night), but clean, and all the rooms have sea views. Key rooms: Nos. 8–11 have large, vine-shaded terraces; No. 11 has frescoes; No. 13 has two rooms to sleep a family of four. Fornillo is the quieter side of Positano, a steep clutch of houses above its own beach just around the headland west of "downtown" Positano (by which I mean a mere ten-minute amble along a lovely cliffside path). 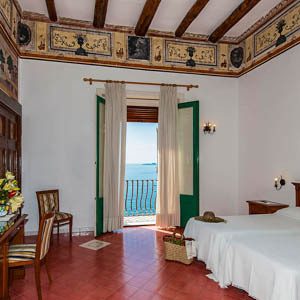 This six-room B&B has fantastic views over Fornillo beach to a medieval pirate watchtower. 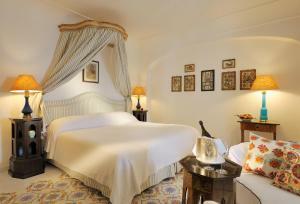 The best room: elegant "Tramontana," with a fireplace. There are also two rooms with kitchenettes, perfect for families on a budget. Bonus: It's one of the few hotels in Positano that stays open through the entire winter. This friendly, family-run establishment comes with a homey feel and some of the cheapest rates in town, yet it lies just five minutes up from the sandy beach at Fornillo. Rooms have vaulted ceilings, tile floors, and small sea-view terraces. Bonus: there are also mini-apartments. 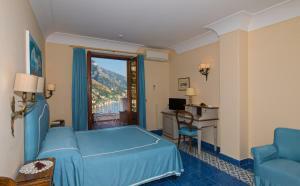 Rooms in the nearby dipendenza (annex) are larger and furnished in an antique style. A great budget find. About 3km (2 miles) beyond Positano is its sister hamlet of Praiano, also a trendy resort village (only much smaller and still little-known) with a majolica-domed church. The Costa Diva is exactly what a coastal retreat should be: spilling down the hillside in a series of lush garden terraces and rural structures converted by the Milo brothers into lovely, unique, and secluded rooms named after Italian film divas who made movies on the Amalfi Coast in the 1950s and 60s. Hotels aren't your only lodging options. In fact, hotels are often the most expensive options available, yet rarely are the most fun or remarkable. For a more memorable trip, you might want to try an alternative accommodation that (usually) costs less and (usually) affords you a better a chance to get closer to the local people and culture. Positano has two main bus stops for the coastal SITA bus coming from Sorrento. For most of the downtown hotels, get off at the second stop, 'Sponda," just east of the center of town. The exception (at least among the hotels listed here) is the Casa Albertina, for which it's better to get off at the first stop.